They are young. They are tanned. They are Francisco y Fernando. Nearly everyone in the U.S. thinks that all the hits are composed here and in the U.K. Wrong. Before there were CDs, before the internet and digital TV there were Francisco y Fernando. My guess is that they were Spaniards but I am not sure. Vamos a la Playa was a big hit across Europe. “Vamos” and “playa” may very well be the first Spanish words I learned thanks to these bare-chested youths. So big was this song that I never noticed the names of the artists. I just didn’t care who they were until the other day someone sent me this cover. They had another big song. “No Tengo Dinero” pretty much had the same tracks consisting of a flat drum machine and a first generation digital keyboard. The arrangement was identical to the “Playa” song. They just swapped out “Vamos a la Playa” with “No Tengo Dinero” (I’m Broke). “Vamos a la Playa” had few other lyrics, mainly a strong beat and an invitation to go swimming with Francisco and Fernando. Actually, a pretty good song. Structurally very similar to Kraftwerk’s best music. I am jogging my brain to remember if these dudes ever went to the Eurovision song contest (those not familiar with this institution simply must follow the provided link). It’s a pity if they did not make it all the way to the Euro top. After their songs were forgotten F&F probably lip-synced their two hits in Ibiza dance clubs, dropped some X and fooled around with younger guys. In the morning they would pack their beach towels and tanning lotions and hit the beach. They may still be trolling the isle of Ibiza. 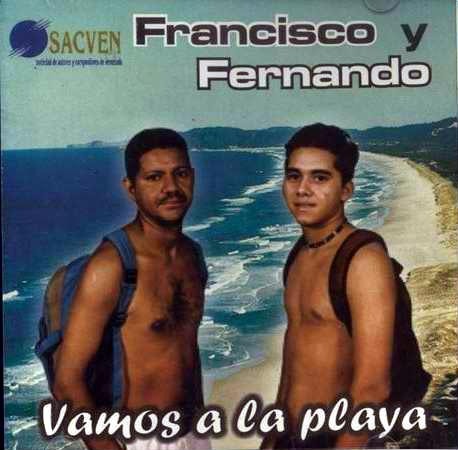 This entry was posted in Records and tagged Bad record covers, fransicso y fernando, vamos a la playa. Bookmark the permalink.